In anticipation of exams starting next week, I wanted to share a tip about Panopto videos that you might not already be aware of. 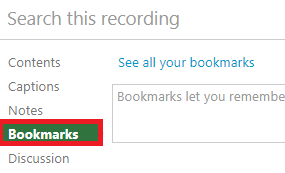 If your professor records your classes, you can add custom bookmarks to those recordings by following the instructions below. This will save time if you plan on watching multiple recordings of your class and you want to come back to an important part later. If you’re in a study group, you can also share these bookmarks with others (also included in the instructions below)! You can bookmark specific times in a recording that you want to return to. Upon logging in, you will see a tab on the left side for marked content. To start, click on a session you’d like to bookmark. This will take you to the normal viewing layout. On the left-hand side of the screen, either in the top or underneath the primary video/audio, click on Bookmarks to highlight it green. Once you click the bookmark button you will be prompted to label your bookmark at the time of entry. Enter a note in the text box, and hit enter. This will save your bookmark. If you click on the “1:19” area you will move the session playback to this time. Now, click on See all your bookmarks. Back in your Panopto home screen, you will now see a Bookmarked section that has a number 1 next to it, or the number of however many bookmarks you’ve created. 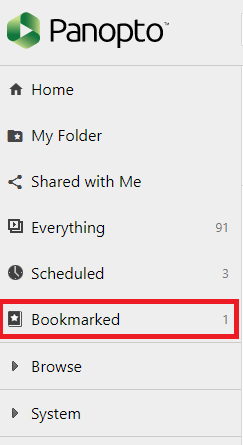 Click on one of the bookmarks you created. This will launch the session as normal, and resume playback at the allotted time you’ve bookmarked. You can remove a bookmark by clicking the X in the viewing tab . Note: You can send these marked viewing URL’s to other viewers. Just copy and paste the URL generated by your bookmark link.